Hanoi (VNA) – Pangolin hunters and smugglers could face a maximum sentence of 15 years in prison under the Penal Code No 100/2015/QH13, as from July 1, 2016, according to Nguyen Van Thai, Director of Save Vietnam’s Wildlife. Non-profit Save Vietnam’s Wildlife is working together with Cuc Phuong National Park in the Carnivore and Pangolin Conservation Program (CPCP), which looks to protect pangolins, an endangered species which is protected as stipulated in Decree 160/2013/ND-CP. The Penal Code No 100/2015/QH13 imposes more severe punishments for the illegal hunting, killing, raising, transport and trade of pangolins. Illegally transporting and trading from 1 to 6 pangolins will be fined from 500 million VND to 2 billion VND and sentenced to between one and five years in jail. The punishment will be raised from five to ten years in prison if the number of pangolins is from seven to ten and from 10 to 15 years in jail if illegally trading and transporting more than 10 pangolins. 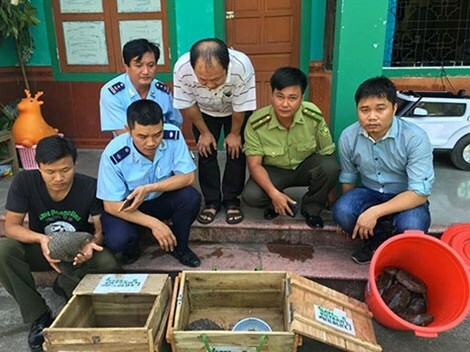 On May 19, two alive Manis pentadactyla-typed pangolins were found in the luggage of Nguyen Van Duong who lives in Dien Hong commune, Dien Chau district, Nghe An province, when he passed the Nam Can International Border Gate in the province’s Ky Son district. The inspection force also discovered ten alive turtles (Palatysternon Megacephalum) in the luggage, without attached legitimate documents as well as certificates of origin. All pangolins and turtles were transferred to the quarantine area at rescue centres in Cuc Phuong National Park. The case reflected the close coordination between the Carnivore and Pangolin Conservation Program, the border gate’s customs division, the border guard station at the border gate, Ky Son police and Ky Son district’s ranger division. Nguyen Khac Chien, Deputy Head of the Nam Can International Border Gate Customs Division, said many wild animals, especially pangolins, are illegally being transported and traded from Laos to Vietnam.